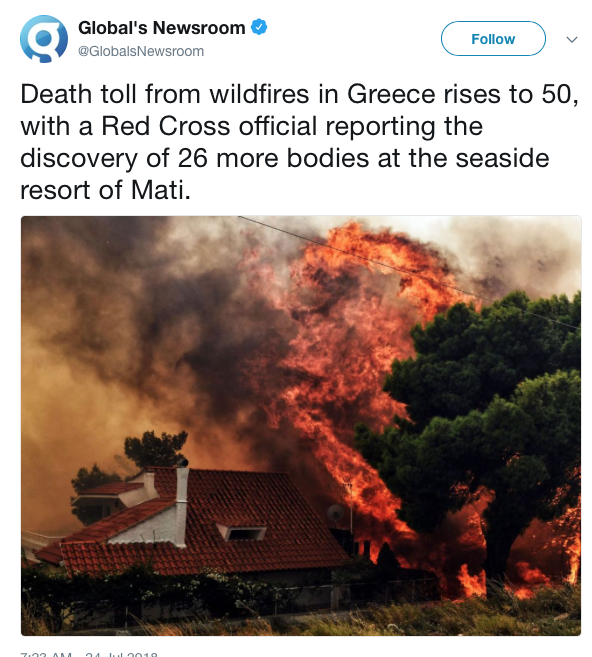 Tourists are amongst the hundreds fleeing wildfires in Greece, which have already at least 50 lives. So far, 26 bodies have been found in a single yard in the seaside village of Mati, 25 miles north-east of Athens. Many are believed to have been tourists. The local fire service confirmed another 24 people had died in the blaze, which has engulfed the Attica region. Many of the dead are believed to be young children. Some holidaymakers were trapped on a beach, and had to be evacuated by boats and helicopters. A search-and-rescue operation is being conducted for 10 tourists who tried to flee one of the fires in a boat, officials said. The Foreign Office has updated its advice to UK visitors to the Athens areas, saying: "On 23 and 24 July, there have been wildfires in a number of areas in southern Greece, including close to Athens; they have been confined to limited areas, but within those the impact has been high, with significant loss of life. "Most visits to Greece, including to Athens, are unaffected; you should keep up to date with local media reports and follow the advice of the Greek authorities in affected areas. "If you've been affected by the wildfires and need consular assistance, you can call the British Embassy in Athens on +30 210 7272 600; if you're in the UK and worried about a British national in Greece, call the FCO on 020 7008 1500." Hundreds of firefighters are battling the blazes and the authorities have called for international assistance. Help is also needed in central Sweden where at least one person has died and dozens have been injured by forest fires as temperatures continue to soar across much of Europe.